Although Anne has experimented with many different forms of art, she currently is focusing on detailed botanical paintings on vellum and large oil paintings of plants. Working from live plants that grow in her garden, Anne renders detailed drawings that eventually become brightly colored botanical paintings of plant flowers, roots, bulbs, leaves, and stems. Detailed drawings also serve as the base for her oil paintings. Anne has studied extensively at the Corcoran College of Art and Design, earning a certificate in drawing and painting. She also has studied at the Brookside Gardens School of Art & Illustration. Anne shows her work widely in the Washington, D.C., metropolitan area, and she has won several awards honoring her work. 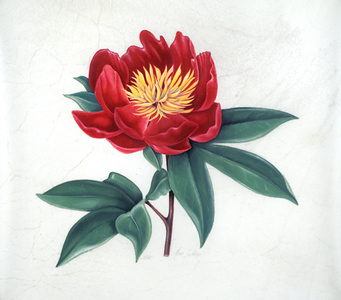 She belongs to the Botanical Art Society of the National Capital Region, the American Society of Botanical Artists, and the Art League of Alexandria.